Scaevola species (Generic term for these in tropical Eastern Polynesia) . 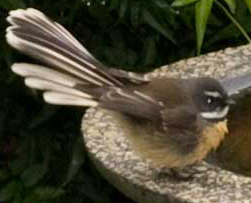 PROTO CENTRAL EASTERN POLYNESIAN, equivalent to, but not a regular reflex of Proto Polynesian *Ngasu (Scaevola species). The "pata" element in this word is somewhat mysterious. 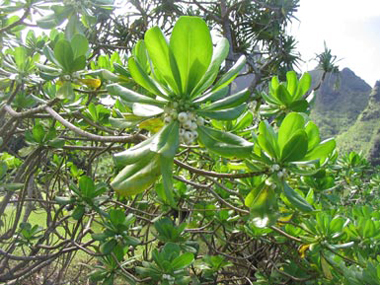 Apparently pata is or has been used as a synonym for naupata in the Tuamotus, and it is listed in the Williams dictionary as a synonym for the mänuka, Leptospermum scoparium. Neither usage seems particularly common, although further research may reveal some interesting links and explain its conjunction with nau in this Eastern Polynesian word. 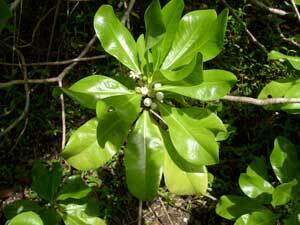 Nonetheless, the links between what is denoted by the reflexes of the word *naupata in the various Eastern Polynesian languages are quite clear -- shrubby plants with glossy leaves, quite variable in form depending on the environment (so the same species can be small trees in sheltered places or just low resilient shrubs in exposed situations where few other plants would grow), and vaguely reminiscent of the plants called Nau in Samoa and Tonga, and the Lepidium species to which that name was attached in Eastern Poynesian. 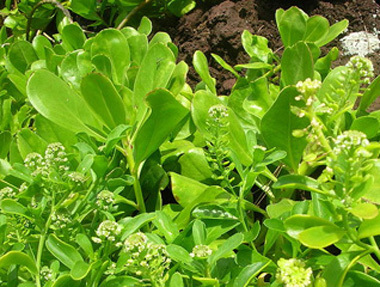 The superficial similarities among the Eastern Polynesian nau (Lepidium spp.) and naupata (Scaevola spp. in the tropics, and Coprosma repens in New Zealand) are illustrated in the left-hand column of the gallery below. The link further back into an earlier stage of the development of Polynesian languages is illustrated on the page for the Mäori word naupata and its common variant taupata (link in the etymology box, above right). 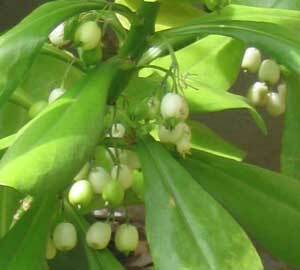 As well as their form and resilience, these plants are also linked by their medicinal qualities. 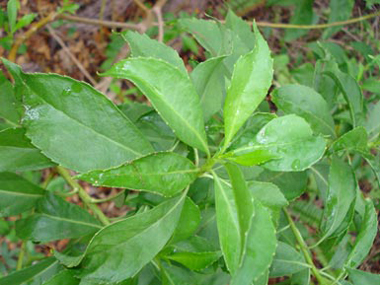 The Samoan naunau (related botanically to the Mäori naupata) is used in Samoan traditional medicine as a remedy for stomach complaints and diarrhoea. 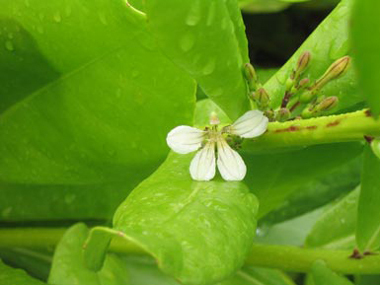 In the Tuamotos, according to the Stimson & Marshall dictionary entry for ngapata (a species of Scaevola, also known as naupata and apparently also pata), "the inner bark of the roots is scraped and mixed with monongi in the preparation of a remedy to draw sores, boils; the berries are squeezed directly into the ear to relieve pain and cause ear-boils to break". 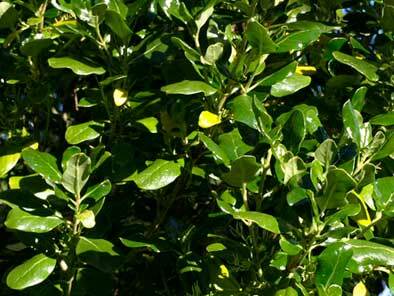 The New Zealand naupata was one of a number of Coprosma (karamü) to which were ascribed powerful spiritual powers in connection with healing and general wellbeing. 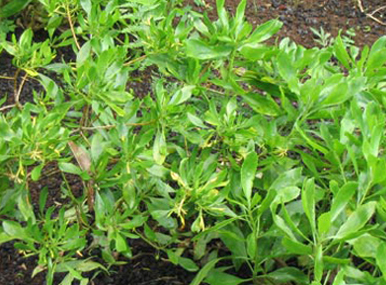 Sources of Photographs: Lepidium - Forest & Kim Starr : http://commons.wikimedia.org/wiki ... ; Scaevola mollis, photo by David Forman, Honolulu; other photographs by R.B.